Crabs everywhere, except in the tackle shops. CARP – The Alternative approach. What happened to the normal poor weather and bad conditions to spoil a typical British bank holiday? I don’t know about you, but I had a cracking weekend. Unfortunately I was unable to get the peeler crabs I so desperately wanted, but it didn’t stop me catching loads of fish and having a great weekend. Lets take a look at just some of the great catches that happened over the weekend. Firstly Dan Church proved, on a trip to Abbotsbury that you don’t need fresh peeler crab to catch smoothounds. He opted for two frozen peeler wrapped in squid to take this lovely hound. 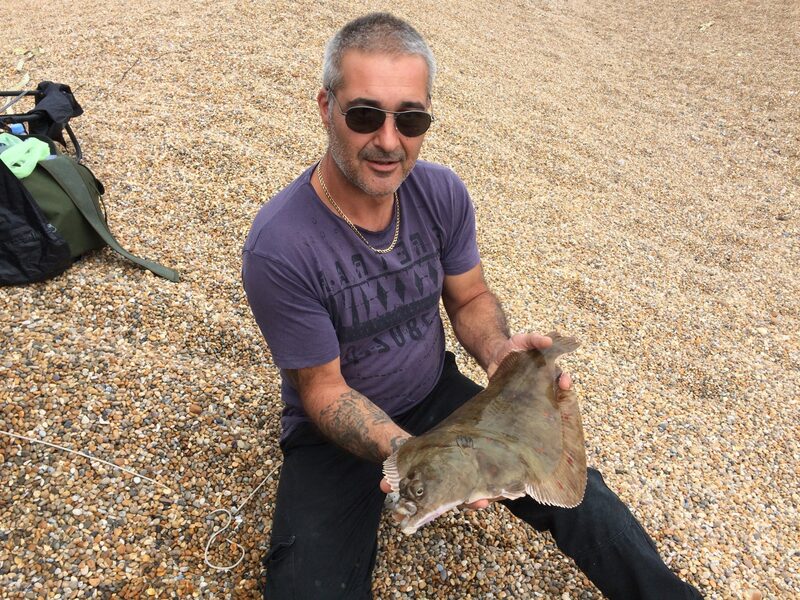 Mark Parfitt sent me this report from a recent trip to Chesil: I have been sea fishing for about four years now and a plaice was still on my list for a new species . This year I’ve put in about 8 sessions around the Solent area trying for one but only managing a few small dabs. I came down to Chesil a good few weeks ago and had a chat with Tom at Abbotsbury tackle. He told me they were a good distance out , which just about ruled my casting distance out . I came down yesterday for a session targeting smoothound for a bit of sport and a few mackerel for a weekend BBQ, but unfortunately took one look at the water and knew the mackerel wouldn’t be close enough. So armed with ragworm and 6 good peeler from Tom I focused on the hounds. Top of the tide had a banging bite and thought I was into a ray. When I saw the orange spots I almost wet myself with excitement, I couldn’t believe what I was looking at, not only my first ever plaice but a 4lb 12oz absolute beauty caught on a 3/0 pulley Penney with a bunch of rag. Happy man was an understatement. Through the day I also managed 5 smoothound biggest going 7lb and a doggie. It was without doubt the best day time session I’ve had, packing up due to running out of bait about 8.30. On the long drive home all I could think was eat it ? Or stuff it? What a day but there was one guy 50 yards to my left and two to my right about 80 yards away who caught nothing . Thanks for sharing your trip with us Mark. I would love to feature more of everyone’s pictures and tales. It is amazing how two days can be so different. I decided to try for some Mackerel from Chesil. When we got to the waters edge, one look at the tea coloured water was enough for me to know it wasn’t even worth wetting the lines. I decided to go after some Bass on lures instead. I headed over to Portland Harbour and a mark that normally produces over high water. Unfortunately with such a small tide this weekend, there was not enough water to bring the Bass close to shore on that mark. I knew another couple of marks that would produce, but not till the tide started to ebb. I had a long lunch, then headed to my next mark. First cast and myself and Gavin had knocks from Garfish, We could see loads of Garfish following the surface lures, but not hooking up properly. I switched to a 5g Fladen mini shore jig and had even more hits, but still no hook ups. Gavin went for a larger Maxi shore jig and straight away had a Bass. I quickly changed and was also hit straight away. Even though we were using different colours (green and blue), it was the size of the jig that made the difference. I found the same pattern last year. The more I use shore jigs and work on the different ways of using them , the more I like them. I will create a video on the different way of using them, so you can see how effective they are as lures. At the end of the day both myself and Gavin had at least 30 each and my other mate John had loads as well. 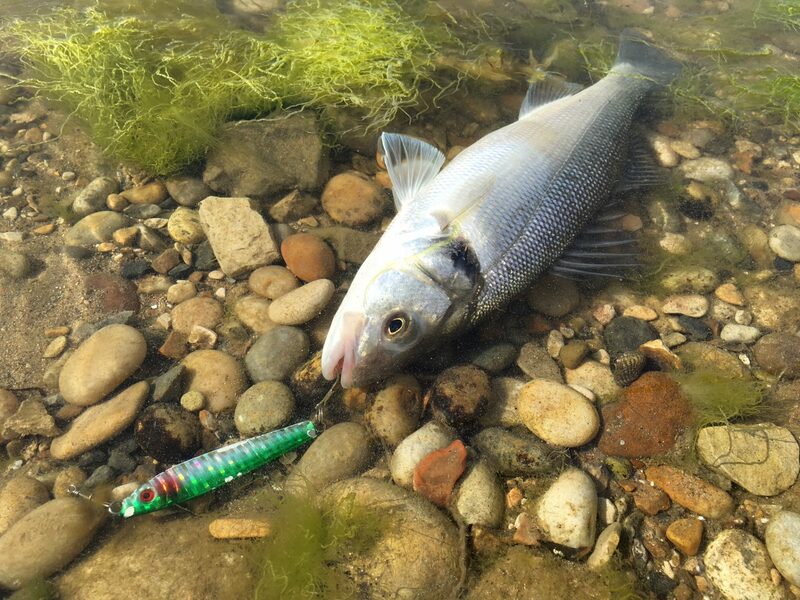 There was no great size to them, but it shows that the Bass stocks seem to be recovering. As I said earlier, it is amazing how two consecutive days can be so different. I went back yesterday at the same state of the tide and all I managed was a couple of knocks from Garfish. Chesil Beach forecast: with the water so coloured with May water, mackerel fishing is pretty much out of the window. The May water should clear in a couple of weeks. The Smoothhounds don’t seem to be effected by the algae bloom and are my top target species this week. There is still a good chance of a plaice. Portland: Wrasse fishing all over the island has been amazing. My friend Nathan Edgell managed 70 over a couple of days. He was using soft plastic lures. 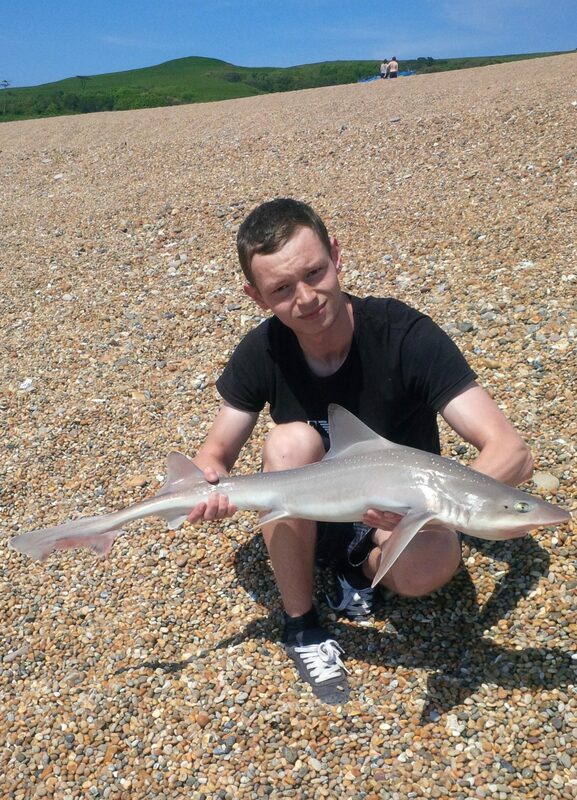 Weymouth Bay: As usual the piers continue to fish well with bait. 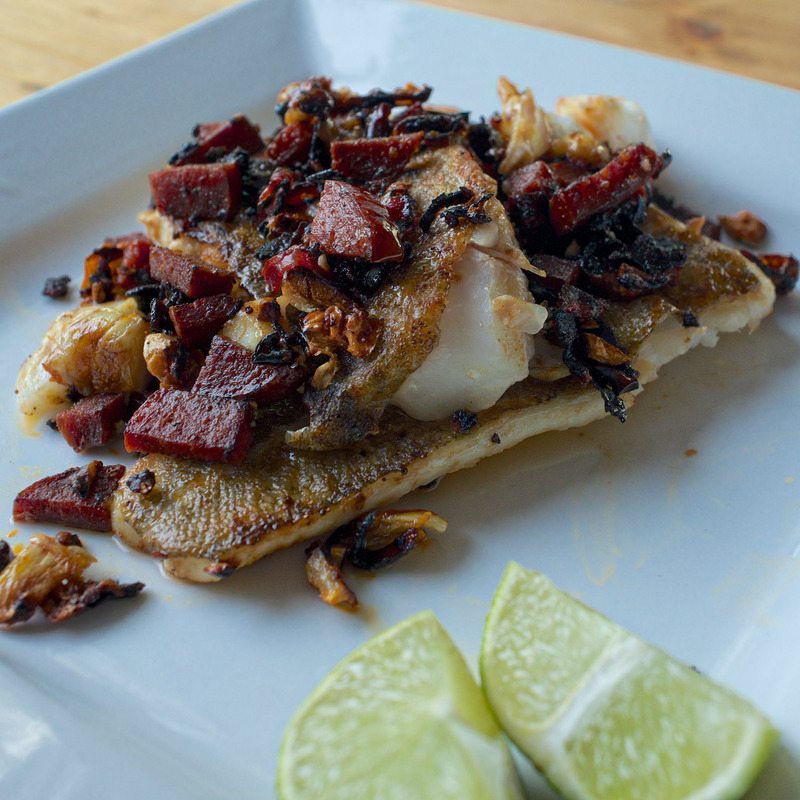 Ragworm will tempt the Wrasse and Pollock, whilst small strips of Mackerel are ideal for Mackerel, Garfish and Pollock. Preston Beach should fish reasonably well for dabs and flounder, but there are better marks that I have mentioned above for this week. 5 Responses to "An untraditional bank holiday"
Great report. I was the guy 50 yards to the left who caught nothing. When I saw Mark pull in that plaice I knew it was a special fish. I fished on through the night but only had dogfish and pouting and one dropped smoothound. Cest la vie! Congrats again to Mark on that super plaice. That is fishing for you Rob. I know it happens to me regularly. But it is seeing someone catch a decent fish, that makes you go out time and again. Absolutely Sean, I love the challenge of Chesil, you just never know what will happen next! Thanks again for the great reports and articles!